It can be really stressful parents-to-be begin researching how to choose a car seat. But the best car seat is one that fits your child and car appropriately and you’ll use the best. Not all car seats fit all cars but finding car seat dimensions is easy, and you can pick one appropriate to your vehicle. A quick check on Consumer Reports can give you car seat safety ratings, as well as an indication on how well it will install into your car via the LATCH system or using the seat belt. 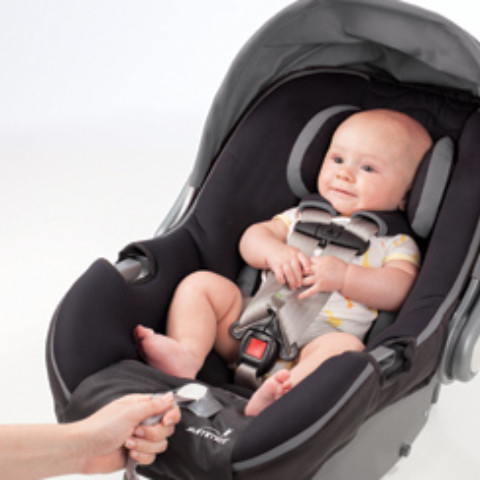 Infant car seats feature removable bucket seats that clip in to a base that stays in the car. These are handy for transporting sleeping newborns or carting infants on errands. However, infant car seats are outgrown quickly, and children need to be moved to convertible car seats. Convertible carseats stay belted in the car, but can be installed rear-facing for infants up to 2 years of age, and then turned around to front-facing for preschoolers. It is recommended to keep children rear-facing for at least 2 years, even if they grow out of the infant seat. Switch to the convertible seat but keep them rear facing as long as you can – it is safer! When you are ready to install the seat you’ve chosen, read the directions before you attempt to install it yourself. Next, follow the instructions to install the car seat. Then, once you have done your best, visit www.safercar.gov to find the nearest car seat checkpoint. (It is a free service but you may need an appointment.) The licensed car seat check person will inspect your installation and make any needed adjustments. Seven out of ten of people install carseats incorrectly. After-market products like mirrors, head rolls, strap covers, and toys are not recommended for use with carseats. Each carseat is crash tested the way it comes and if you add an after-market product there is no guarantee it will work as it should. During the colder months, nothing should be added under the baby in the car seat such as, blanket or snowsuit. Instead, use a simple blanket or cover over the car seat that does not interfere with the harness. Also, if you are involved in a car accident, even if the seat is not affected, you should replace it. Lastly, if you plan to use a used car seat, it is important to know the history of the seat. Ask for the date of expiration, if it ever in a car accident, and if there was smoking allowed around the seat. You can learn more about protecting your newborn in our Infant CPR and Safety Class. We hope to see you there!